This is a five day class with a minimum of 40 hours. The Basic Arborist class is built for individuals looking for instruction on professional tree care training and on climbing with a rope and saddle. This class size is limited to 12 people at a time, and will be taught both hands-on and in the classroom. If you’re interested in this class, please contact Alex Subak for pricing details at (800) 622-2562 x 240 or asubak@acrtinc.com. ACRT Arborist Training is the premier arborist training school in the country. Our classes are taught by experienced industry professionals, and we’re dedicated to making the industry safer one individual at a time. If you’re interested in becoming a part of our training team, we’d love to hear from you. We’re always looking for interested individuals to join our staff and help pass on the importance of safety and education in the tree care industry. Learn more about our open positions here. Learn more about the prerequisites for our classes and the topics we cover by following the links below. This is a five day class with a minimum of 40 hours. 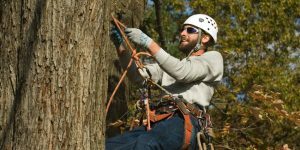 The Basic Arborist class is built for individuals looking for instruction on professional tree care training and on climbing with a rope and saddle. Had a great time in ACRT’s Line Clearance class. Found instructors to be professional and knowledgeable. Highly recommend this course. Thank you for a great week.